When I checked the blog schedule, I realised I had planned to announce today the release of the first Gospel of Mark Bible Study Leaders Guide eBook. Instead, I’ll be announcing a different sale that I have dreamed about for many years. Some of you may know that I write Christian fiction. I’m delighted to let you know that I have sold my first contemporary inspirational romance book to Harlequin’s new Heartsong line in the US. My story has Australian characters and is set in Sydney, Australia. I’m very excited about this wonderful opportunity and the Mark eBooks will be coming soon. In Mark 1:16-20 we learn how Jesus called four of his disciples. Simon (Peter) and his brother Andrew were fishing by the Sea of Galillee when Jesus walked beside the shore. Mark’s account of what happened next is brief. Jesus said “Come follow me, and I’ll make you fishers of men.” The brothers immediately left their fishing nets behind to follow Jesus. Jesus then walked further along the road with Simon (Peter) and Andrew and he spotted James, son of Zebedee, and his brother John in a boat. The brothers were working with their father and the workers preparing nets for a fishing trip. Jesus called the brothers to follow him. James and John left their father and the workers in the boat to follow Jesus. It is believed that the disciples knew about Jesus because of their previous connection to John the Baptist. Jesus called ordinary men to leave their work, families and livelihood to follow him. According to Mark’s account, there was no time for the men to say ‘I’ll think about it’ or ‘I’ll get back to you.’ No time to farewell family, pack up their fishing gear or finish their day’s work out on the boat. The call to discipleship was a radical decision that demanded their dedication and total commitment to following Jesus. A commitment to become ‘fishers of men’ who would catch people for God’s kingdom. A radical decision that I wonder how we would respond to if Jesus turned up at our workplace and called us to leave everything to follow him? 2009 Retailer’s Choice Award winner! 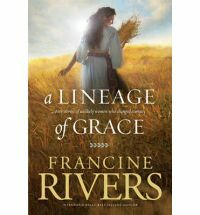 In this compilation of the five books in the best-selling Lineage of Grace series by Francine Rivers, we meet the five women whom God chose – Tamar, Rahab, Ruth, Bathsheba, and Mary. Each was faced with extraordinary – even scandalous – challenges. Each took great personal risk to fulfill her calling. Each was destined to play a key role in the lineage of Jesus Christ, the Savior of the World. Narelle: Unafraid is the final book in Francine Rivers’ Lineage of Grace novella series and is a fictionalised account of Mary’s story. It’s hard to comprehend Mary’s life and the amazing blessings she experienced by being the woman chosen by God to give birth to Jesus, God’s son. We journey with Mary through her remarkable life as she experienced great joys, trials and heartache. It is fascinating to consider what Jesus may have been like growing up as a boy in a normal family and to consider how he may have interacted with his parents and siblings. Angels had appeared to Mary and Joseph to reveal Jesus’ true identity. His brothers and sisters struggled to understand their older brother’s character and decisions, especially when Jesus left the family to embark on his ministry. I recommend this book to those looking for an insightful and intriguing story about one of the most famous women in history. Bible Society Australia are encouraging people to ‘Live light in 25 words’ by reading 25 words or more from the Bible every day from October 1-31. Reading the Bible daily for 31 days can help you develop a routine and create a habit of daily Bible reading. I have signed up for the challenge on Bible Society Australia website and my family is going to read the Gospel of Matthew during October. You can follow our reading progress through the book of Matthew on the 30 Minute Bible Studies Facebook Page. There are 28 chapters in Matthew and our family goal is to read a chapter a day. I’ve included a link below to a ‘Live light in 25 words’ YouTube clip to encourage and inspire you to think about taking up the challenge of daily Bible reading. We all lead busy lives and it can be easy to forget why it is important to read God’s word every day. By liking our Facebook page you can receive our daily Bible reading updates in your newsfeed. I encourage you to spend time each day meditating on God’s word. The Gospel of Mark provides a brief account of the temptation of Jesus. The Spirit sent Jesus into the desert immediately after his baptism. When John baptised Jesus, the heavens opened, the Spirit came upon Jesus and God the father spoke from heaven to his beloved Son. We learn more details about how Satan tempted Jesus in Matthew (4:1-11) and Luke’s (4:1-13) gospels. Matthew and Luke record three specific incidents where Satan tempted Jesus to sin. On each occasion Jesus responded to Satan by quoting scripture. While Jesus was in the desert he didn’t eat any food. Satan tempted him by suggesting that if Jesus was really the Son of God, he could turn a stone into bread and satisfy his physical hunger. Jesus responded by saying that man doesn’t live on bread alone. Satan led Jesus to the Holy City and the highest point of the temple. He tempted Jesus by suggesting he throw himself down and allow the angels to save him. Jesus responded by saying the Lord God should not be tested. Satan took Jesus to a high mountain and showed him all the kingdoms of the world. He tempted Jesus by offering him dominion over all the kingdoms if Jesus bowed down and worshiped him. Jesus responded by saying worship the Lord and serve only him. Jesus’ mission was spiritual and Satan continued to tempt him throughout his ministry, reaching a climax when Jesus was on the cross. Paul Barnett in his book The Servant King: Reading Mark Today talked about the final battle, symbolised by day becoming night (Mark 15:33). Jesus is a new Adam, the Son of Man who is Lord over the wild animals and prevails over evil. Adam fell into temptation but Jesus resisted temptation and remained obedient to God. Satan was finally defeated through Jesus’ death and resurrection. When young widow Lady Lydia Gale helps a French prisoner obtain parole, she never dreamed he would turn up in her parlor. But just as the London Season is getting under way, there he is, along with a few other questionable personages. While she should be focused on helping her headstrong younger sister prepare for her entré into London society, Lady Gale finds herself preoccupied with the mysterious Frenchman. Is he a spy or a suitor? Can she trust him? Or is she putting her family in danger? Readers will enjoy being drawn into this world of elegance and intrigue, balls and masquerades. Author Laurie Alice Eakes whisks readers through the drawing rooms of London amid the sound of rustling gowns on this exciting quest to let the past stay in the past and let love guide the future. 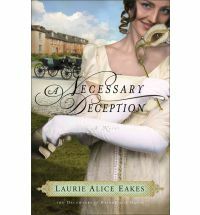 Narelle: A Necessary Deception is Book One in Laurie Alice Eakes’ The Daughters of Bainbridge House regency romance series. Lydia is a complex character who I wanted to see overcome both past and present obstacles to rescue her often wayward family members and find her place in a world where women often had limited choices. I really enjoyed the political intrigue and suspense element in the story that kept me guessing until the end. The historical backdrop of the wars with the French and Spanish, and the trouble brewing in America, added an authenticity to the story. The regency period is often glamourised and this story takes a different slant as it looks at the regency era through the eyes of a Frenchman. I highly recommend this story to those looking for an exciting and captivating regency romance. One of the challenges I face as a parent is how to encourage my kids to read the Bible. Sometimes the sheer size of a Children’s Bible can be intimidating plus the decision on where to start reading can be time consuming in itself. I recently came across a great little resource from Bible Society Australia called Top 10 Bible Stories From Mark. It’s a small book, 68 pages, written and illustrated in a way that will appeal to kids. There are ten chapters that cover the main stories in the Gospel of Mark. I really liked the cute cartoon-style illustrations that drew out the main point in each story. The stories themselves are not para-phrased but are taken from The Bible Today – Contemporary English Version. It’s a fun way for kids to read the Bible and learn more about the Gospel of Mark.